Catsan Natural Biodegradable Clumping Litter is an environmentally friendly way of providing your cat with a litter box that is always clean and hygienic. Made using a wheat by-product that would otherwise go to waste, Catsan Natural Clumping Litter is 100% natural and biodegradable without compromising on odour control. 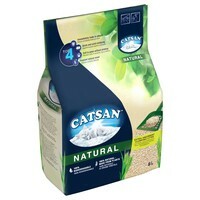 The solid lumps that Catsan Natural Clumping Litter forms and its pleasant natural scent are perfect for locking in odours.